Tibet leaves a lasting impression on its visitors. I’m almost sure this has to do with its captivating atmosphere. An atmosphere that can only accurately be described as spiritual. The atmosphere in Tibet wields you in, demands that you be present and engages you. Fully evoking your senses. An atmosphere of prayerfulness floats across the city through the day. Men and women walk in serene quietness. In habitual meditation. In 2016 I was one of four Africans selected to attend the first master’s programme in China Studies at the prestigious Yenching Academy of Peking University. My reflections on a year of new experiences and lasting impressions. 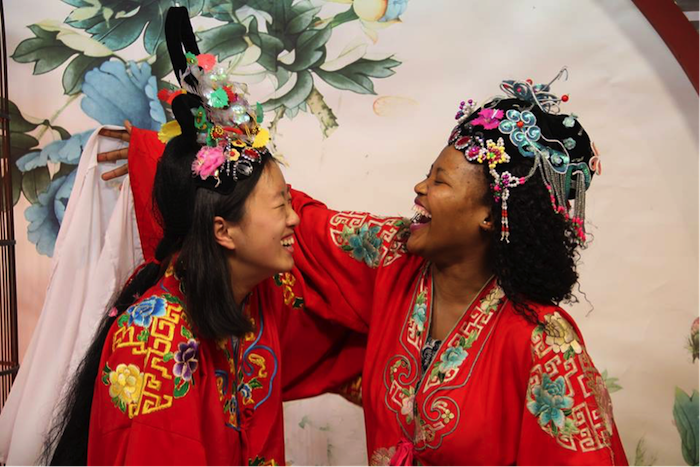 Alice Fang and Sihle Nontshokweni at Sichuan Opera. Tibet held a light to it. A magical light that evoked and captivated my senses. I know I may sound like I am exaggerating but give me a second..
Once in a while as people, we see or touch or sense things or people or places that are so different to our known knowns. These things or people or places have a spark and newness that awakens us, it almost feels magical. In May, I traveled to Tibet-I touched and felt a sort of magic whilst prancing the streets of Lhasa and Shigatse in Tibet. In this post, I simply wanted to stuff your eyes with the wonder of Tibet’s magic. Her charitable views: white blue clouds. Her vibrant oranges, reds, crimsons seen in fluttering prayer flags across alleyways. The charming and heartwarming faces of Tibetan children and elders. Her dreamy images, beautiful, blue glamouring night skies. I hope you enjoy the magical moments that I experienced through this apple crunch.